From the simple representative shapes used to record transactions of goods and services in ancient Mesopotamia, to the sophisticated typographical resources available to the twenty-first-century users of desktop computers, the story of writing is the story of human civilization itself. Calligraphy expert Ewan Clayton traces the history of an invention which—ever since our ancestors made the transition from a nomadic to an agrarian way of life in the eighth century BC—has been the method of codification and dissemination of ideas in every field of human endeavour, and a motor of cultural, scientific and political progress. He explores the social and cultural impact of, among other stages, the invention of the alphabet; the replacement of the papyrus scroll with the codex in the late Roman period; the perfecting of printing using moveable type in the fifteenth century and the ensuing spread of literacy; the industrialization of printing during the Industrial Revolution; the impact of artistic Modernism on the written word in the early twentieth century—and of the digital switchover at the century’s close. 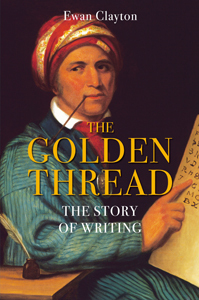 The Golden Thread also raises issues of urgent interest for a society living in an era of unprecedented change to the tools and technologies of written communication. Chief among these is the fundamental question: “What does it mean to be literate in the early twenty-first century?” The book belongs on the bookshelves of anyone who is inquisitive not just about the centrality of writing in the history of humanity, but also about its future; it is sure to appeal to lovers of language, books and cultural history. EWAN CLAYTON is a distinguished calligrapher and professor in the Faculty of Arts, Design and Media at the University of Sunderland. For a number of years he worked as a consultant to Xerox PARC with an interest in digital communications technology. He has exhibited and taught calligraphy in many parts of the world.